%10 Discount off Couples Course! Happy Holidays and a Happy New Year from the Aspirations Family, to yours. 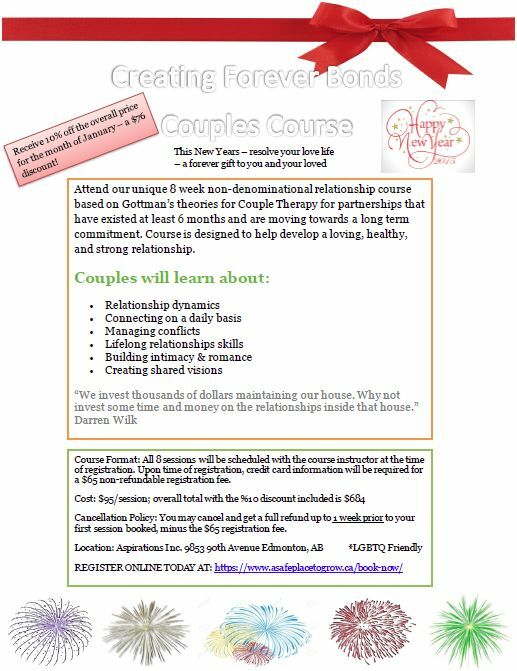 As it is the season of giving, Aspiration’s gift to you and your loved one, is our %10 discount off our Creating Forever Bonds Course to help resolve your love life in the New Year, for the month of January! For more information take a look at the poster or call us at 780-468-1366. Anyone interested feel free to register yourself online here.